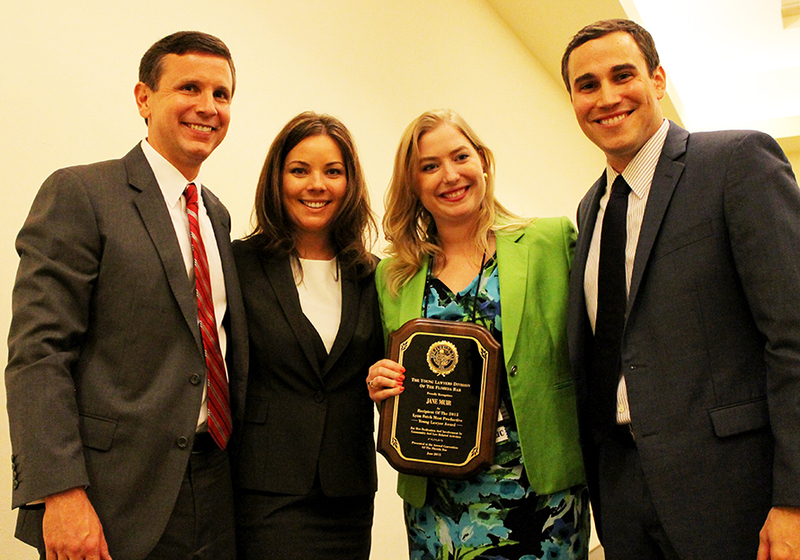 The Florida Bar Young Lawyers Division has chosen to honor Jane Muir with the 2015 Lynn Futch Most Productive Young Lawyer Award. This award is given to a young lawyer who is not a member of the Florida Bar YLD Board of Governors, who has worked most diligently in the past year in Bar activities and/or law related public activities and who has an excellent reputation for legal abilities and integrity. The Florida Bar Young Lawyers Division created the award in Ms. Futch’s honor, after she died, suddenly and tragically, of a heart attack while grocery shopping. She was only thirty-nine years old, but she had earned a stellar reputation in the legal community. At the time of her death, Ms. Futch was acting general counsel for the Broward Sheriff’s Office, and had served as president of the Broward Bar Association. She still managed to find time to volunteer for Women in Distress, Friends of the Fort Lauderdale Libraries, the Broward County Boys and Girls Clubs, and United Way of Broward County. Click here to see the Florida Bar News article.